I’m trying to keep busy. I’m doing dishes, I’m paying bills, I’m caught up on the 800 emails that came in while I was on vacation, and I’m heading out to rake leaves before my lawn is mowed in the morning. I’m also trying NOT to think about Torties! I’m thinking that if I stop thinking about Mugsy, she will go into the trap. So instead of Mugsy, I will think about my own cats! I’ve always been an orange cat kind of gal. I’ve had orange kitties for as long as I can remember. Mellow orange kitties. 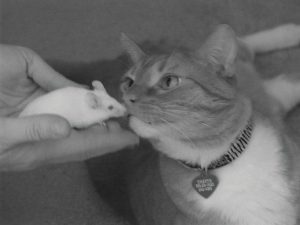 So how I ended up with Cheeto, a flubber-bellied cat who weighs 22 pounds, who runs up and BEGS to have the whiskers on his chin (slightly) pinched with tweezers, and who insisted on having his own pet mouse, is beyond me. 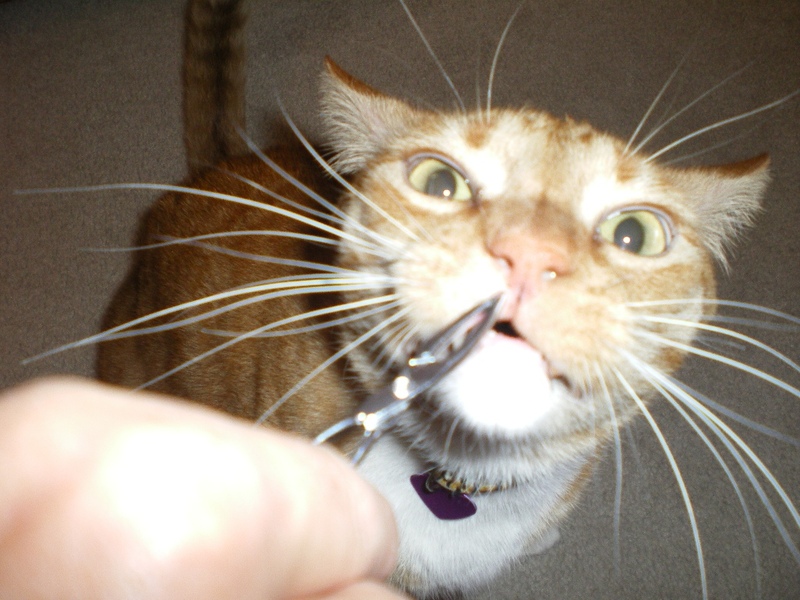 Does Anyone Else Have A Nutty Cat That Likes Tweezers? Yes, a pet mouse. His name was Squeakers and he lived for just over two years. He never bit me. I trained him to do tricks. I loved that mouse, and after he went to the giant cheese-wedge-in-the-sky (due to natural causes, not Cheeto causes) I rescued (from a snake who belonged to a friend) a second feeder mouse. But the moment I got this new mouse in my house, he bit me! I was afraid to pick him up. And because of that, I just couldn’t think of a good name for him (a few bad names, just not any good ones). So I named the new mouse Chicken. 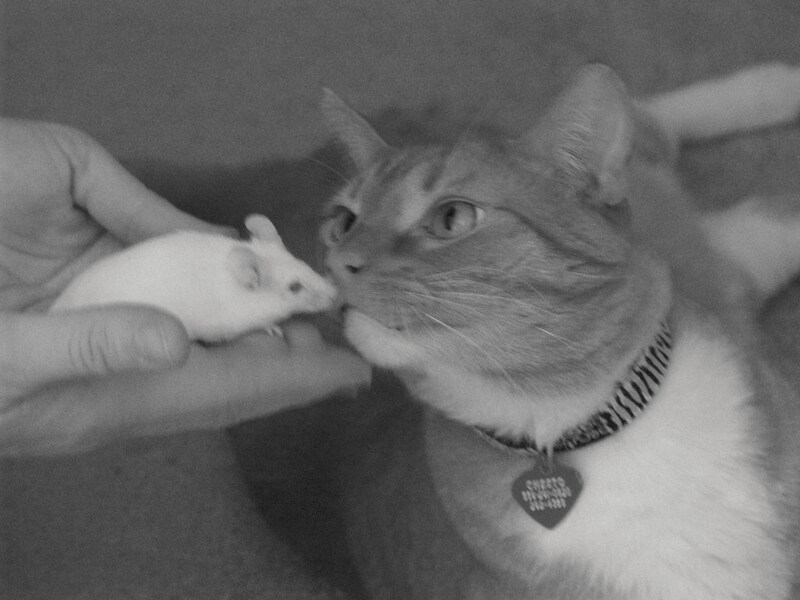 And in spite of the fact that I never trusted him enough to pick him up again, he spent the next two years entertaining my cats before he died of old mouse age. I feel so much better telling happy cat stories and I hope you enjoyed this one. I will dive back into pet detective cases in a day or two. I just needed a day or two to BREATH!